Drop City began on a rooftop in Kansas, where two young artists, Gene Bernofsky and Clark Richert, dropped art from their studio onto the street. They wanted to make art a part of everyday life. 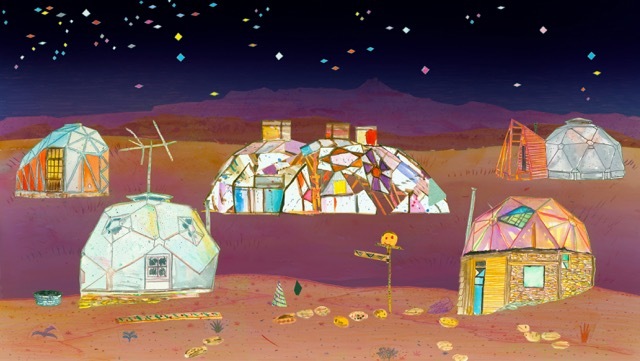 In 1965, together with Jo Ann Bernofsky and Richard Kallweit, they bought a small piece of land in southern Colorado, and were soon joined by other artists, writers and inventors. Inspired by Buckminster Fuller’s geodesic domes and the crystalline designs of Steve Baer, they used scrounged materials, bottle caps and chopped car tops to build a new civilization on the scrapheap of a wasteful society. Their experiments with art, architecture, solar energy and resourceful living would come to define a global counterculture. Joan Grossman’s film documents the rise and fall of Drop City, one of the first rural communes in the United States of the 1960s. The event is accompanied by a display of ON/OFF.